Let's face it – there's a lot of crap out there on T.V. And with the ever increasing amount of T.V. programming in general, there's bound to be more and more that's not only just horribly made, but inappropriate as well. Far be it for me to tell someone what media is or isn't appropriate. I would almost never (except for my kids) call someone to the carpet for watching something I thought was inappropriate. But there are some shows that are clearly over the line of acceptability. I'm sorry, but there just isn't a single redeeming quality whatsoever about Jersey Shore. The people, what they're doing, why they're even on T.V. to begin with – all reprehensible. And I haven't even seen it to be able to make that claim – I can just intuit from my uncanny understanding of the media zeitgeist that the show is awful in every send of the word. Sorry if you're a fan ... you just ... shouldn't be. 1. 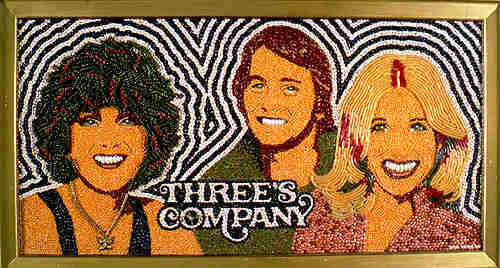 Three's Company: I'm guessing I'm not alone on this one. In the show, Jack Tripper lives with two female roommates, Crissy and Janet, though none of the three of them had a relationship. They're just Company. I guess these living arrangements were pretty scandalous, because I've had numerous friends comment on how they weren't allowed to watch this show either. Not that I ever wanted to watch this show; Wikipedia says "the humor in the show was based on farce, often relying on innuendo and misunderstanding," which can only mean hilarity from the get go! 2. The Three Stooges: I'm not sure if this one will seem weird to other people ... were we unique in not being allowed to watch it? I always assumed that my parents prohibited this one for the violence. And it wasn't like shooting people violence – it was down-to-earth, practical violence that we might actually employ. Since our family had three boys and no girls, The Three Stooges were going to hit too close to home and my brothers and I would start poking each other in the eyes and kicking each other in the groin. Not that we couldn't have come up with those things on our own, but my parents didn't need the process accelerated. Fair enough. 3. The Simpsons: Let me preface this one by saying that this show was only prohibited in our household for a short period. My brother was well into high school when it became popular and I was getting old enough to understand it. Frankly, I think the show in its heyday was hysterically funny and somewhat groundbreaking. It just wasn't a kid show and there weren't many adult cartoons on then. There was so much sarcasm in it that a little kid might take the wrong way. I think the ban on my watching was lifted much in part because of the fact that my mother – the main objector – was often found lingering in the back of the room when my older brother was watching. She was caught watching only when we heard her trying to suppress a snicker and then turned to see her with a guilty look on her face. Were these shows unique to my family? What weren't you allowed to watch as a kid? Come and knock on my door.